Firetti Builders was founded by Joe Firetti, Sr. who built many homes in the Baltimore/Washington area. 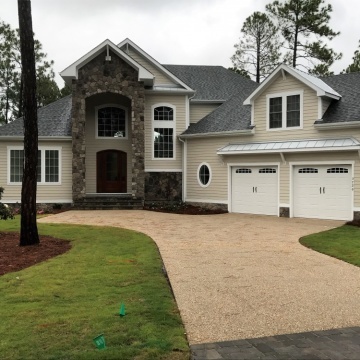 Firetti Builders moved to North Carolina in 2001, where Joe Firetti Sr. and his son Joe Firetti II have built over 100 homes in SouthEast North Carolina. Joe, Sr. officially retired from Firetti Builders in 2005. 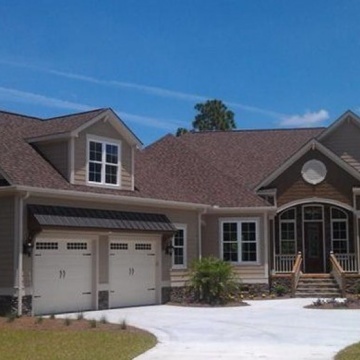 Joe II has expanded the corporation into various communities in the Brunswick County, NC area such as St. James Plantation, Winding River, Waterford, Compass Pointe and Magnolia Greens. Joe II is a graduate of the University of Maryland with a Bachelor of Science Degree from the College of Business and Management. He resides in Brunswick County with his wife and son, Pamela and Reid. Mr. Firetti is amazing and highly responsive and involved in all aspects and his staff and recommendations are phenomenal!! Please see individual comments to specific questions. 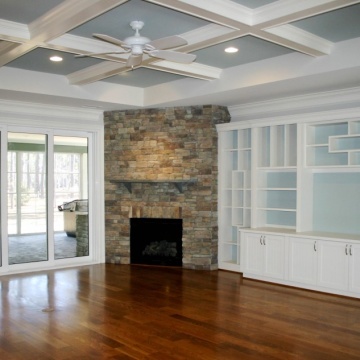 We have absolutely NO REGRETS about choosing Firetti Builders. We are certain that choosing a quality builder like Joe will pay off in the long run. In the short run, we are so proud of what he and his staff and subs have built. They are craftsmen. Firetti Builders exceeded our expectations in several important process and building aspects and met expectations for the remaining. 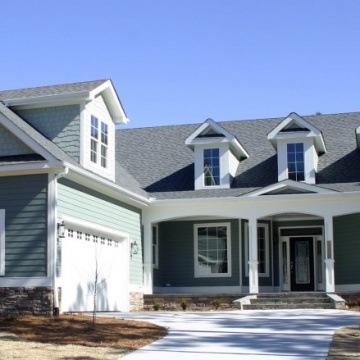 We highly recommend this builder in the southeast North Carolina area. So far the process is going smoothly with the exception of weather. We hope Firetti Builders will exceed our expectations if the home is completed by mid-October. Superb communicator with excellent follow-up. Flexible and accommodating. Joe and his staff are friendly and easy to work with. Joe made the process fun. Joe is honorable and trustworthy. He aims to please. It has been a pleasure having my home built by Firetti Builders. From the moment we met Joe, we knew he was the right guy for the job and we have been proved right every step of the way. We are very pleased with Firetti Builders, their staff, and subcontractors. The quality of workmanship is top notch and we are pleased with our new home. We absolutely love and appreciate being able to work with their interior designers. We would readily recommend Joe Firetti. Firetti Builders, Inc. took more time than average to make sure they understood our expectations and requirements for our new custom home. they met or exceeded my expectations in the areas of scope definition and management and budget control and management. They disappointed me in the areas of schedule management and managing client expectations. All said and done they build a high quality custom house and will work with you to provide what you desire. It is important to clarify the details of the scope as much as possible at the front end of the project as changes can be costly if made too late in the project.Owners need to be aggressive and on top of the schedule, and require explanations for changes to ensure they are reasonable. 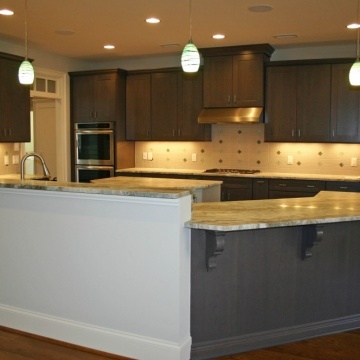 Firetti Builders is a quality custom home builder. Their team is in a league all their own from Joe Firetti, Jay, Michelle, and Debbie to all their sub contractors, they made the build process easy, communicated well, kept to a schedule and built a high quality home for us. I would recommend Firetti Builders to anyone. Joe Firetti is a builder you can trust and who keeps his word! The Firetti team is fantastic to work with, has quality subs that are knowledgeable and provide guidance, provides quality craftsmanship, keeps to schedule and just a pleasure to work with. A great experience to work with Joe Firetti and team! I am very pleased with the total experience and overall performance of Joe and his team. Joe and his team were a pleasure to work with. We are very happy with the end product. Joe really helped with the home design and had good ideas for how to improve the look. The final outcome is beautiful and the quality of workmanship is excellent. The construction site was kept extremely clean throughout the build. 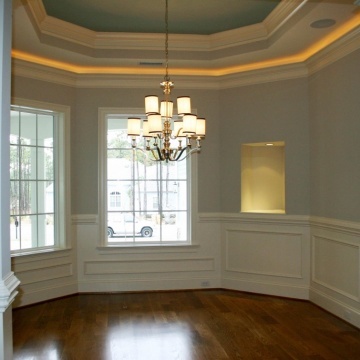 Joe Firetti is an exceptional custom builder who incorporates excellent subcontractors to complete the build to a high level of workmanship. Joe was incredibly patient with us over many months of looking at models and plans to see what would work on our property with unique dimensions (like a slice of pizza), offering suggestions that we incorporated into the final design. We are very pleased with the final product and have utilized the subs for additional work since we moved in 6 months ago as an indication of how much we liked them and their work. The actual structural work was quite impressive when compared to some of the other builders with a house I know would survive even the largest storms. Any issues we faced Joe responded immediately even when not really his issue which we truly appreciated. We wholeheartedly support and endorse Firetti Builders to be your builder. 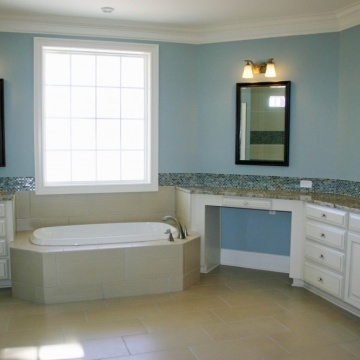 The subcontractors were easy to work with and also offered different ideas. 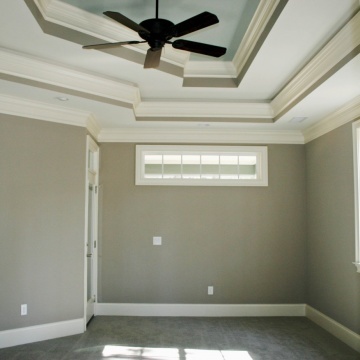 The built-ins by Eric have received rave reviews from guests, electrical by Rick, landscaping by Greg and the multitiered deck by Brett all made an impact on the final design. 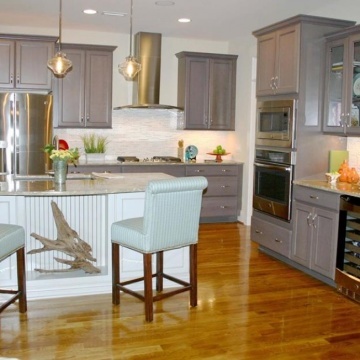 The kitchen is the centerpiece of the house and working with Linda proved to be the best move and having a designed island of 4' by 11' makes it the social center of the home. The stone work on the front of the house made a huge impact visually on curb appeal. All the subs were excellent and Joe made sure they worked effectively and on schedule. A few recommendations and then a visit to the model on Wyndmere to meet Joe. He impressed us and although we visited many other builders, which helped us determine what features were important to us for the new house, we felt very comfortable with Joe and moved ahead with him. It was a wise decision and being in NY while the build was taking place made us rely on Joe's team of Jay, Michelle and Debbie in the office. A professional organization that builds a quality home! Easy to work with and very responsive. Overall quality of the home. Joe Firetti is professional and personable, and will spend as much time as needed to discuss your ideas. We always felt comfortable speaking to him or his associates to discuss any changes or problems during the construction process. They would make every effort to resolve any issue to our satisfaction. Joe Firetti is a good communicator. We feel that he is good and easy to work with. Upon meeting him, we had an innate confidence in Joe, based on his knowledge and experience in building quality homes. His specifications include a very sound, secure infrastructure that wiil save money in the future in the heating and cooling of our home.We cold- called some of his former customers in differ parts of NC and, to a person, they concluded that Joe is a builder who not only knows how to build a "geat' house but is a man of integrity, who has a passion for building homes that are "personal to the buyer." Definitely and discussed security with us . Locks all doors. Neighbors told us usually the lan'i is left open, but not with Firetti. 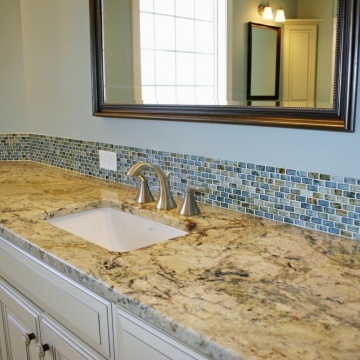 Joe's sub contractors use quality materials, and take pride in their work. Very open to suggestions and act upon the suggestions. Yes sometimes several times per day. ALL communifications have been responded to in a timely manner. Oh yes, Joe calls in members of his staff to discuss problems and they come up with suggstions. Jay, Patti, Michele commicate effectively with one another, with us and with Joe. All are in a loop along with necessary other subcontractors. Our trust in Firetti has been well-placed! Joe and his team were a pleasure to work with. We give Firetti Builders an enthusiastic and unqualified recommendation. Communication is so key, and Firetti Builders excels. He's known for his text/email/phone responsiveness and is superb when dealing with issues, hiccups, problems, questions, anything unexpected that comes up. He's open, listens, and creatively works towards solutions. We trusted his take on things because we always knew he had our best interests at heart. His management team is excellent -- and they really do work as a team, and his suppliers were, for the most part, wonderful to work with, did a super job, and had obvious respect for Joe. We felt we were in good hands from start to finish. Our home is stunning. 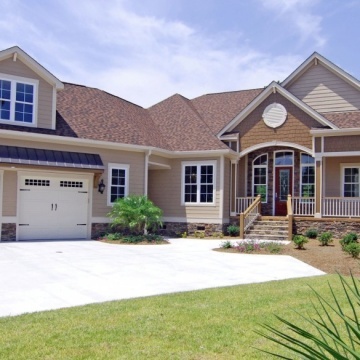 Joe listened to our ideas and built a great quality, custom home. Everyone was absolutely professional, courteous and very helpful. I was most satisfied in terms of the brainstorming done and Joe's flexibility. The ideas that joe had for spaces we weren't sure of were very good. We were going to have an extra bathroom, and I didn't want five bathrooms. I asked Joe what to do with the space, and we ended up making it a drop zone. I hadn't even heard of a drop zone before. I was very happy he recommended that. I also added a sunroom that I adore. Things that we mentioned that were not usable for us as we physically saw the space, he was able to come up with some ideas that worked for us. We are very happy, and we love it here. They built a beautiful home. I was pleased with Firetti Builders, I enjoyed working with Joe he was professional, prompt, superb, responsive, organized and customer service oriented. Word of mouth from previous customers. Very satisfied with overall planning,construction and final product. The Firetti "Team" provided us with a home we can be proud of and enjoy for many years to come. My wife and I are so terribly pleased with the house that Joe and his team built for us and the experience we had working with everyone throughout the process. I have never built a home from this far away so we were concerned about keeping on top of the progress, but Joe is a great guy and his subs work so well together, we always felt like we were in good hands. I particularly want to thank Michelle for sending pictures every week to keep us up to date on the progress on the house. These were a life-line for us throughout. They work so well together and speak of each other as a family. There were a couple of times where we had to remind Joe of decisions, but they were few and minor. With everything we needed to get done the process was great. In all cases Joe and his team made us feel like we were in charge. The outcome was spectacular. The teamwork of the subs was outstanding. The quality of the workmanship is still something that my wife and I marvel at. Cat-Tales. We interviewed a couple of builders when we came down to St James and immediately felt good about Joe and the houses he showed us.